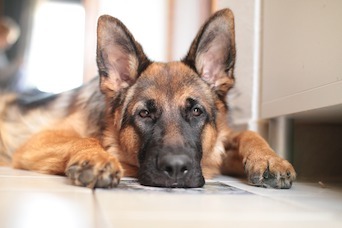 The agency believes that floppy-eared dogs appear friendlier and less aggressive to travelers. With their loud noises, long lines, and time constraints, airports are not a necessarily calm place, but the Transportation Security Administration (TSA) believes it can ease one point of tension for travelers. Sparked by the unusually large number of its dogs retiring in 2018, the agency is transitioning its canine airport sniffer squad largely from pointy-eared to floppy-eared dogs. According to The New York Times, about 70% of the 1200 TSA dogs have floppy ears. Five of the 7 breeds in the program—Labrador retrievers, golden retrievers, German shorthaired pointers, wire-haired pointers, and Vizslas—have floppy ears. The other two, German shepherds and Belgian Malinoises, have pointed ears. Despite the move to more floppy-eared pups, air travelers can rest assured that they will be protected in airports. “No dogs will be pulled off because they have pointy ears,” said TSA spokesman James Gregory. “It’s stringent, and we put them through extremely difficult tests.… But at the end of the day, the dog’s going to be out there because they’re qualified, not because of their breed." The TSA employs the second highest number of dogs of any federal agency. One-third screen airport passengers, and two-thirds are certified to smell explosives on baggage. The dogs can also be tasked with helping local law enforcement when needed.